ESIGN THINKING is a field that uses the designer’s sensibilities and methods to match people’s needs with what is technologically feasible and viable to create innovations. Designers use all sorts of methods to empathize with people, to create definitions of problems, create prototypes for improvement, and for gaining feedback from those who will use their products. Foster a generative, respectful, and psychologically safe place to explore and create - ideas flow and the innovation is real. The human centered design process is a proven method to guide people towards a life well lived with harmony and balance. One exciting design trend is to mimic nature to take advantage of the millions of years of R&D that nature has conducted. This technique is called Biomimicry. Consider how to improve a water turbine. This shows how studying a snail and leaf can help designers create a water turbine that reduces energy by 85% and noise by 75%. There are ways you can learn about design thinking. Wake Forest University’s Charlotte Center offers a certificate program called Design Thinking for innovative Business Problem Solving. The program includes six sessions during which participants learn about design thinking, its methods, and hear from experts about their use of this important way of thinking. The program includes a jazz band (to discuss collaboration), artist (to talk about presenting information visually), a theater director (to discuss how to make a play compelling), and a designer (to talk about prototyping). This way of thinking can be applied to new products, services, processes and even becomes a way of doing business. For example, we can find ways to improve the ways in which we work by looking for more user-friendly environments. The designers would observe how people interact at work. The goal is to discover ways that work-environments could be more productive, appealing and use fewer resources that deplete the earth’s natural capital. Two methods I like are looking at a situation and asking questions of “what?” “where?” “who?” “when?” “how?” “how much?” and “why?” These observational questions can lead to understanding about a situation — for example, a work situation. Using this lens to observe work can then be followed with interviews of workers. All of the time the designer is looking for ways to create desirable, feasible, viable and sustainable ways of improving work situations. Another method is to develop prototypes of the intended innovations. These prototypes could be physical products, flow-diagrams or even a small skit to portray the intended improvement. Prototypes are then presented to clients and users for their feedback. In fact, every innovation can be considered a prototype — something that can be continuously improved. Lest you think this is a fad, consider that many large organizations have embraced design thinking. Among the firms most involved are Pepsi, Siemens, Procter and Gamble, Kaiser Permanente, IBM, and many more. Design firms such as IDEO and Continuum are becoming corporate consulting. IDEO even help to set up d.school at Stanford University. This “school” involves students from business, engineering and art and architecture who work on problems using design thinking. The University of Toronto Rotman School of Business uses design thinking as the basis of its MBA program. Design Thinking plays a significant role in our Masters of Sustainability Program and our mission to create a sustainable world. Photography credits for main image : Scott McCullough. 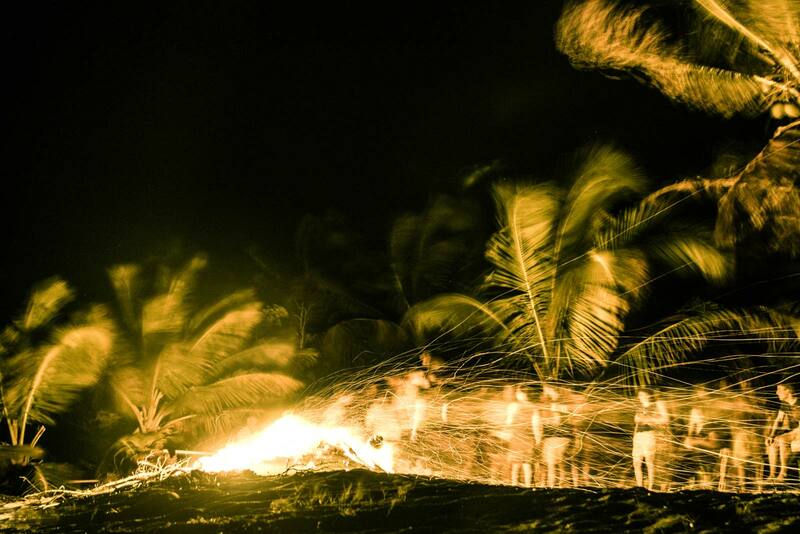 Wake Forest University Sustainability Program students enjoying a bonfire at Long Caye in Belize.